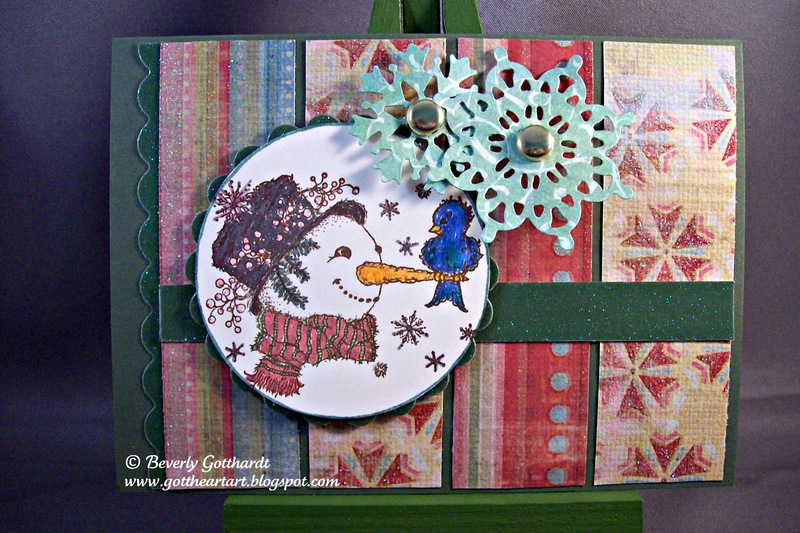 I've got a Frosty card tonight with some sparkle and bright colors instead of the usual blue, white, and silver. I've been using this paper for a couple of years and it's still some of my favorite Christmas paper. This was the perfect sketch for showcasing these strips and using the last of my resist paper snowflakes. Love all those vertical stripes but the bluebird on Frosty's nose is too cute! Hi there Bev! Wow, I was out of commission for a couple of days. Long story short, I managed to dislocate my shoulder :( But I'm ok now and on the road to recovery. I LOVE the paper and how you used it so effectively in a striping pattern. and, THANK YOU for passing the Liebster award to me...I am so honored! You help me discover new challenges; you are a great source of inspiration and motivation to me too!